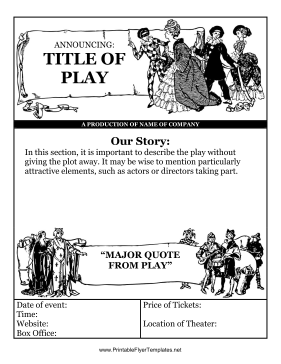 If you're putting on a play, this flyer is exactly what you need to get in touch with your audience. The flyer features actors and banners in a classical style, making this a great Shakespeare flyer, although it can be used for many different types of plays. It can even be folded and sent out to nearby residences to fill up seats. Don't forget to put in information about the date and time!